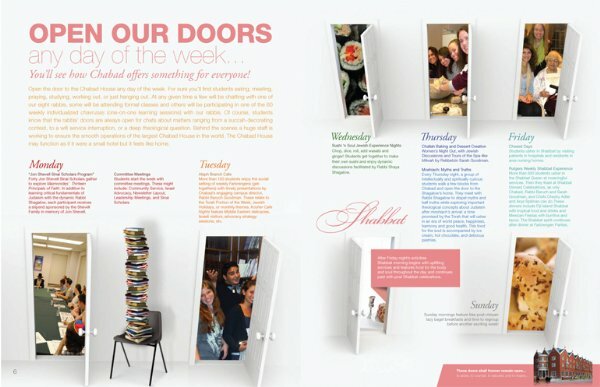 Open our doors any day of the week... You’ll see how Chabad offers something for everyone! Open the door to the Chabad House any day of the week. For sure you’ll find students eating, meeting, praying, studying, working out, or just hanging out. At any given time a few will be chatting with one of our eight rabbis, some will be attending formal classes and others will be participating in one of the 60 weekly individualized chavrusas (one-on-one learning sessions) with our rabbis. Of course, students know that the rabbis’ doors are always open for chats about matters ranging from a succah-decorating contest, to a wifi service interruption, or a deep theological question. Behind the scenes a huge staff is working to ensure the smooth operations of the largest Chabad House in the world. The Chabad House may function as if it were a small hotel but it feels like home. Forty Jon Shevell Sinai Scholars gather to explore Maimonides’ Thirteen Principals of Faith. In addition to learning critical fundamentals of Judaism with the dynamic Rabbi Shagalow, each participant receives a stipend sponsored by the Shevell Family in memory of Jon Shevell. Students start the week with committee meetings. These might include: Community Service, Israel Advocacy, Newsletter Layout, Leadership Meetings, and Sinai Scholars. More than 120 students enjoy the social setting of weekly Farbrengens (gettogethers) with timely presentations by Chabad’s engaging campus director, Rabbi Baruch Goodman. These relate to the Torah Portion of the Week, Jewish Holidays, or monthly themes. Kosher Cafe Nights feature Middle Eastern delicacies, Israeli visitors, advocacy strategy sessions, etc. Chop, dice, roll, add wasabi and ginger! Students get together to make their own sushi and enjoy dynamic discussions facilitated by Rabbi Shaya Shagalow. Students usher in Shabbat by visiting patients in hospitals and residents in area nursing homes. More than 500 students usher in the Shabbat Queen at meaningful services. Then they feast at Shabbat Dinners Celebrations, as only Chabad, Rabbi Baruch and Sarah Goodman, and Chefs Chezky Adler and Arye Spilman can do.These dinners include Fiji Island Shabbat with tropical food and drinks and Mexican Fiestas with burritos and tacos. The Shabbat spirit continues after dinner at Farbrengen Parties. After Friday night’s activities Shabbat morning begins with uplifting services and features food for the body and soul throughout the day and continues past with post Shabbat celebrations. Sunday mornings feature free post-minyan lazy bagel breakfasts and time to regroup before another exciting week!